Friends, it's time to forget the eyes. The nightstand is the new window to the soul. A repository for all the things we feel we'll need to have within arm's reach through the night, the bedside nightstand houses a collection that is more telling about one's personality than a few moments of eye contact any day. Two small dressers either with or without drawers and in a variety of different designs, nightstands are meant to flank either side of your mattress in order to balance the largest piece of furniture in the room as well as to house your sleepy-time necessities. Whether it's books we've meant to read, electronic devices, apnea machines, pictures of loved ones or a dream journal or two – nightstands function as a comforting, secretive little spot where we keep things near and dear to us close at hand - literally. Anyone who’s had to live without them will tell you that they are an absolute must-have. From modern acrylic designs to stolid classic styles, your choice should be a reflection of your personal style and the feel of your bedroom as a whole. To avoid the ‘hotel room' feeling that overly matched furniture can give, have a little fun with your choice. Like accent chairs, unique nightstands add life to an otherwise uniform set and can serve to highlight the larger pieces in the room. Just be sure that your nightstands are the same height as your mattress so that they anchor the bed on either side perfectly, ensuring that all the treasures within are easily accessible from where you lie. Don’t Forget to Kiss Us Goodnight! 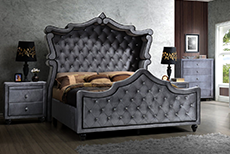 Furniture showrooms are often filled with more overeager salespeople than product, and you might find yourself pressured into leaving with an entire bedroom set rather than the nightstand you had in mind. Finding cheap nightstands for sale online, however, couldn't be any easier. 1StopBedrooms is your go-to spot for all your nightstand needs. With a best price guarantee, no sales tax and most importantly, no pressure, you can take your time finding the right nightstand to fit your style and your budget. We'll ship your choice for free and even set it up for you if you desire. You might want to wait for us to leave before you set up your beanie baby collection though!